Galway City in Ireland-West a perfect base for your holiday in County Galway. Find out more about Galway City below. 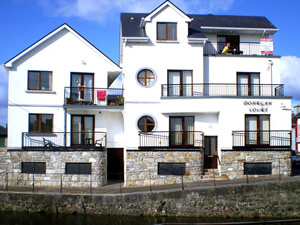 These stylish apartments are located in Galway city in the heart of the city less than a five minute walk to the pedestrian shopping street known as "Shop Street" and the restaurants cafÃƒÂ© and bars on "Quay Street". Allocation of an apartment is on arrival, apartments are either ground floor or first floor and in winter are closed off to the university. . The complex provides free internet access and shared laundry facilities (coin operated)with the added bonus of a secure underground car park.. Each apartment enjoys a balcony and all rooms are tastefully furnished. Galway is noted for its bustling nightlife, theatres, arts festival and horse racing festivals. The seaside village of Salthill with its glorious promenade and sandy beaches is a 20 minute walk whilst Connemara National Park is within a couple of hours drive.Shop. Pub. CafÃƒÂ©. Restaurant 352 yards. Beach 2 miles. GF: lounge/kitchen/diner, twin, single, bathroom with shower over bath, shared utility.Electricity included , storage heaters, linen and towels included, TV, freezer, microwave, dishwasher, shared w/machine, shared dryer, internet access, shared courtyard, shared driveway, off road parking, balcony. Sorry no pets. We have the following details listed regarding Galway City accommodation accessibility but we would recommend that you always confirm these prior to booking with the owner or operator. Galway City is a great base to explore the wonders of County Galway and you will find plenty of activities near by. Galway City is at Galway City, County Galway. Check out the map below for directions, use the controls to zoom in. If you have stayed at Galway City why not add your thoughts, comments, pictures to our Facebook page? Don't forget to add the name/town/page link to your comment so its attributed to the correct place. Please keep it polite, we are sensitive souls! Find Cottage Holidays works closely with independent cottage owners and leading holiday travel operators to provide you the widest choice of self catering accommodation across Ireland. Galway City in County Galway is available through: Imagine Ireland.